Gender and deve­lop­ment is a very broad research area that covers a wide range of research topics. Gender and deve­lop­ment research can focus on social rela­tion­ships bet­ween men and women during dif­fe­rent times in his­tory and places in a narrow context of a family or a com­mu­nity, or a wider context of one region or one nation. Gender and Development is a very diverse and multi-dis­ci­pli­ned research area. The World Women’s Summit orga­ni­zed by the United Nations in Beijing in 1995 spe­ci­fied 12 prio­ri­ties in gender deve­lop­ment. Even today these prio­ri­ties still play a signi­fi­cant role in impro­ving women’s status and in achie­ving gender equa­lity. These 12 prio­ri­ties take into account the social issues that affect women and gender equa­lity such as poverty, edu­ca­tion, heal­th­care, employ­ment, living in rural areas, vio­lence and conflicts, deci­sion-making, envi­ron­ment, etc. Performing research and car­rying out trai­ning on gender issues are among the tasks of uni­ver­si­ties and research ins­ti­tu­tions. Knowledge from this research will pro­vide us with a more gene­ral view of women’s pre­sent situa­tion and a scien­ti­fic basis to reach a more equal and sus­tai­na­ble society. The Gender and Society Research Center (GAS) at Hoa Sen University was esta­bli­shed with an ambi­tion to join this ongoing trend of gender research. Its first target is to ins­pire Hoa Sen University stu­dents and lec­tu­rers who may be inte­res­ted in the objec­ti­ves of this group, that also aims to join the inter­na­tio­nal research net­work in cross-border research pro­jects to work with resear­chers from dif­fe­rent coun­tries in an exchange of know­ledge and expe­rience. With many gender research pro­jects, the choice is to unra­vel the situa­tion of women living in patriar­chal socie­ties where men are pri­vi­le­ged. Since the end of 1970, research on rela­tion­ships bet­ween men and women has been mainly focu­sed on ana­ly­zing these rela­tion­ships in order to gain equa­lity bet­ween the two gen­ders. However, given our shor­tage of know­ledge about women’s lives, it is not sur­pri­sing that most gender research still focu­ses on stu­dying the women’s role in gender rela­tion­ships. We have stu­died the sto­ries about women, sto­ries about heroi­nes figh­ting for our coun­try in the past or about women in high posi­tions in the govern­ment and in science at the pre­sent. However, the life sto­ries of ordi­nary women from dif­fe­rent social clas­ses who lived and worked in society, how they suf­fe­red from ine­qua­lity in a patriar­chal society, and their life achie­ve­ments are absent from all the his­to­ri­cal records. This absence proves to us that there is still a lot to be lear­ned. In addi­tion, what great thin­kers, intel­lec­tuals, or people of a cer­tain time-period in the his­tory of a coun­try thought about the social rela­tion­ships bet­ween men and women and whe­ther they had revo­lu­tio­nary ideas about gender equa­lity, are yet other ques­tions to which we need to find the ans­wers. In many socie­ties, espe­cially in deve­lo­ping coun­tries, women are faced with illi­te­racy, limi­ted edu­ca­tion under the oppres­sion of ine­qua­lity, and social bias against them. Inequality in access to edu­ca­tion leads to ine­qua­lity in employ­ment, income, and social status. That is the reason why so many femi­nists consi­der eli­mi­na­ting illi­te­racy for women and pro­vi­ding occu­pa­tio­nal trai­ning as the top prio­ri­ties on their agenda. Studying how edu­ca­tion paves the way to for­ming a group of female intel­lec­tuals with full awa­re­ness of women’s rights and equal status with men in a family and in society, and of their res­pon­si­bi­lity as citi­zens to their coun­try and to the world is ano­ther research focus of the Gender and Society (GAS) group. Gender-based vio­lence has been a concern of both resear­chers and social acti­vists. Besides domes­tic vio­lence of which the main vic­tims are women and chil­dren, armed conflicts in many places in the world also claim a toll on many female vic­tims. Movements by women under the slogan of equa­lity, peace, and deve­lop­ment at the World Women’s Summit inNai­robi in 1985, reflec­ted their dream of a pea­ce­ful world without wea­pons or conflicts. In war, men directly face the risks of death, inju­ries and post-war dif­fi­culties. Women are also active in bat­tles, and at home sup­port their fami­lies, and at the same time are threa­te­ned by the risk of being killed or inju­red. In some wars, women were degra­ded as tools for men, having to suffer from the severe pain of losing their dignity. War expe­rien­ces and losses suf­fe­red by women during wars have never­the­less not been well-resear­ched and social com­pen­sa­tion for their contri­bu­tion and sacri­fice is under­va­lued as a result. To res­pond to this urgent need, the GAS has laun­ched a research pro­ject entit­led ‘Women and War’ to col­lect memoirs from women sur­vi­vors of the two wars in Vietnam and create an archive. Another aim is to build an inter­na­tio­nal research net­work to exchange expe­rien­ces and research results among resear­chers. All of these three research foci are inter-dis­ci­pli­nary with an empha­sis on ana­ly­zing the influence of culture on the situa­tion of women and their aim to pro­mote gender equa­lity. If cultu­ral change is neces­sary to meet the goal of gender equa­lity and to eli­mi­nate dis­cri­mi­na­tion against women, such change should be brought about. 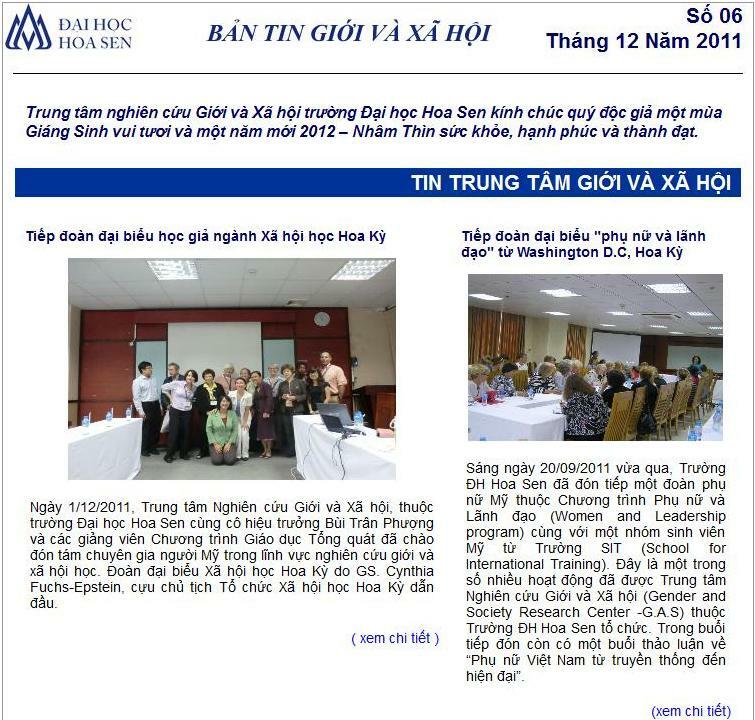 The Gender and Society Center wel­co­mes the sup­port and par­ti­ci­pa­tion of lec­tu­rers and staff at Hoa Sen University.